One more familiar destination with tourist in Southern Vietnam is the Mekong Delta. Talking about the Mekong Delta, people immediately think of tropical rivers, interlacing canals, immense rice fields and the floating homes of some of the residents. Once stepping into An Giang Province’s Chau Doc Town, you can not only visit famous sites such as Sam Mountain, Chua Xu Lady Pagoda or Thoai Ngoc Hau Temple but also can take a cruise to the village to learn more about the floating life of the locals. The fisrt-time to here, I was immediately impressed. Beforehand I just imagined it as being boring because of the river everywhere and mosquito-infested. But it was actually a highlight of our beloved Vietnam. Sitting on a little boat, passing a creek through the mangrove forests, enjoy the feeling of floating on the water and tasting coco juice. The life on the river appeared hectic but in the small fishing villages was so peaceful. Lazing on a small sampan, I feel so tiny on the boundless river and under the shade of countless trees. I’m sure that witnessing the trade on the floating markets surely makes an impression on those in the delta for the first time like I used to. Upon reaching the raft village, you are introduced to the structure of the rafts which are designed as homes and as floating fish farms. Tourists can catch a view of farmers feeding fish and can be served indigenous dishes made from local fish. And if I were you, I would not miss a visit to a weaving village of the Cham people. Here, you can witness the dexterity and talents of Cham ladies who painstakingly weave on looms by the riverside. Oh and there’s one more thing. On the way back, you should not miss the floating restaurants to enjoy specialties of the Mekong Delta in tide-water season. Floating on the immense rivers and taking a look at the lifestyle in the delta are unforgettable experiences. That was my first trip to Mekong Delta. I would be glad if you share yours! 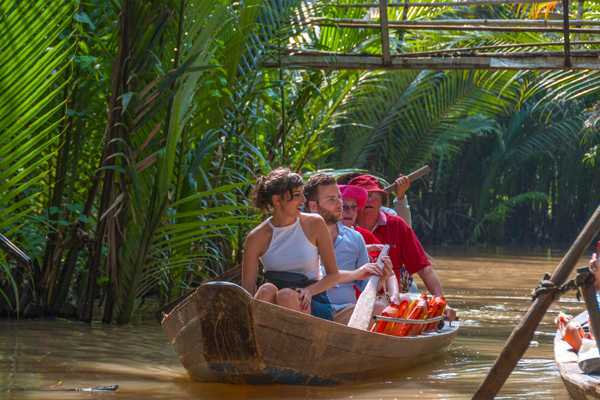 Find-out more about the Mekong Delta tour here!